2017 Kiddie Kamp Class learning about Under the Sea! 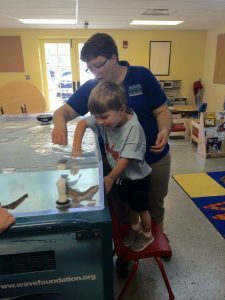 With tremendous help from the teachers and staff at Mariemont Community Church Preschool, MPPG is able to offer a half day summer camp for preschool aged children. Much like a typical preschool program, each morning includes circle time, games, and snacks with a focus on FUN. They will also make adorable t-shirts with their handprint on them for a precious keepsake. Kiddie Kamp is held in the classrooms of Mariemont Community Church Preschool. May 20th-24th 9:00am-11:30am. Lunch is offered 11:30am-1:00pm. Parents must sign campers up for lunch for the entire week to take advantage of this option. Camp is held at the Mariemont Community Church Preschool on 3908 Plainville Rd, Cincinnati, OH 45227. Children born before 4/30/17 are eligible to attend. 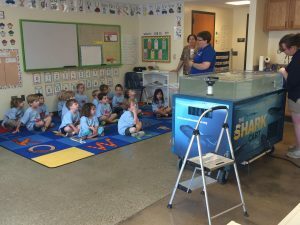 2017 Kiddie Kamp kids met a Shark during the Under the Sea theme week. $68 per camper for the week ($88 for non MPPG families). Lunch is an additional $50 for the week. Campers must bring their own nut free lunch. Registration is open to the public – complete the form here. If you decide not to send your child to Kiddie Kamp before camp begins, and we are able to fill the spot, you will receive a refund. Once Kiddie Kamp begins there will be no refunds issued, except in the case of an emergency.